Finished Panny's dragon and evil eye sleeve today. Thanks Panny, till next time!!! Couple of Puffins added to Simon's japanese Falcon tattoo. Thanks Simon, till next time!!! Finished James's japanese chest piece tattoo of hanya mask and peony today. Thanks James, till next time!!! Finished Charlie's samurai and peony half sleeve tattoo. Thanks Charlie, till next time!!! Great session on Marco's snake/hebi sleeve from today. Thanks Marco, till next time!!! Great start on Oli's japanese tiger and butterfly sleeve tattoo from other day. Thanks Oli, till next time!!! Great session on John's legs from today not far from finishing these and then onto next project. Thanks John, till next time!!! Started tattooing James's japanese chest piece today as extension to his sleeve with peony and hannya mask. Thanks James, till next time!!! Started Oliver's Japanese Samurai and dragon sleeve tattoo today. Thanks Oliver, till next time!!! Started Paul's skull sleeve today. Thanks Paul, till next time!!! Finished Chris's japanese sleeve today. Thanks Chris, till next time!!! Another great session on Wendy's cat and windmill sleeve from today. Thanks Wendy, till next time!!! Finished Keith's japanese dragon and samurai leg sleeve tattoo. Thanks Keith, till next time!!! 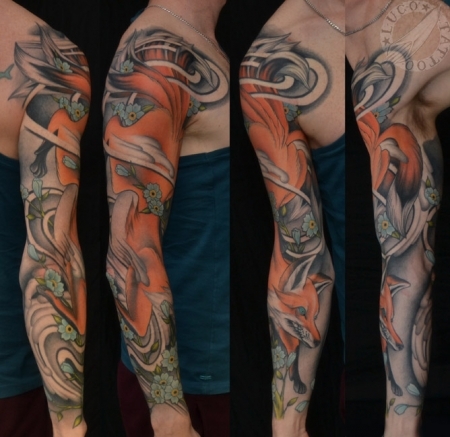 Finished Neil's Japanese fox/kitsune sleeve today. Thanks Neil, till next time!!! One more session on Marcus's skull back piece to add some shading in the background. Thanks Marcus, till next time!!! Did this Japanese wave band on Juraj today, Thanks Juraj, till next time!!! Started James's japanese sleeve today. Thanks James, till next time!!! Finished Dominic's Japanese Foo dog and peonies half sleeve tattoo. Thanks Dominic, till next time!!! 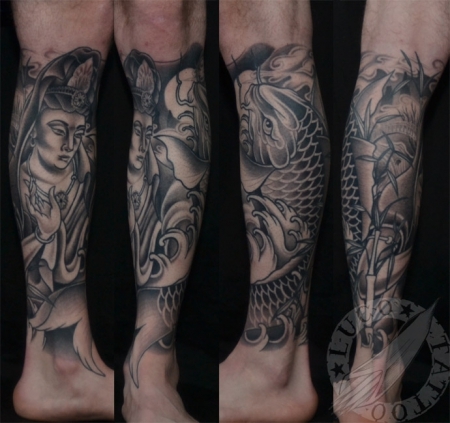 Great session of shading from last night on David's japanese half leg sleeve. Thanks David, till next time!!! Finished Jacob's half sleeve today. Thanks Jacob, till next time!!! Had a great session starting Marco's hebi sleeve today. Thanks Marco, till next time!!! Great session from today on Jake's leg. Thanks Jake, till next time!!! Finished Wagner's half sleeve tattoo today. Thanks Wagner, till next time!!! Maria's Japanese Pagoda tattoo from today. Thanks Maria, till next time!!! Finished Filippo's front snake and skull tattoo. Thanks Filippo, till next time!!! 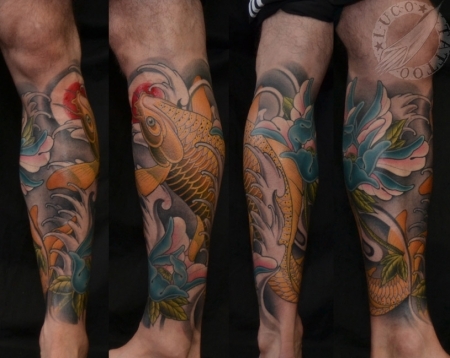 Finished Martin's japanese leg tattoo with skull and koi. Thanks Martin, till next time!!! Finished this hannya and cobra japanese side piece on Marcus today. Thanks Marcus, till next time!!! 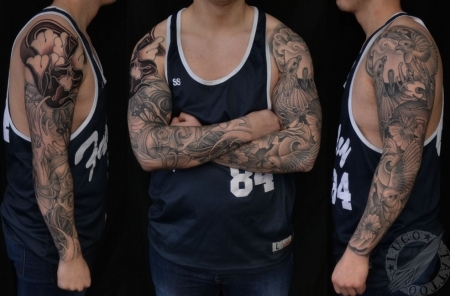 Jake's all healed and settled black and grey sleeve. Thanks Jake, till next time!!! Started Harry's japanese leg tattoo today with kois and blossoms. Thanks Harry, till next time!!! Finished Ervis's japanese leg tattoo today. Thanks Ervis, till next time!!! Finished Nick's japanese chest tattoo of chrysanthemums skulls and samurai mask. Thanks Nick, till next time!!! Another great session from today on John's leg tattoos. Thanks John, till next time!!! Finished Lee's japanese dragon and samurai mask sleeve today. Thanks Lee, till next time!!! Great session from today on Ervis's japanese peonies. Thanks Ervis, till next time!!! Scott's forearm from today. Thanks Scott, till next time!!! Harry's first tattoo! Two japanese sleeves back to back. Thanks Harry, for the trust and dedication! Harry's second japanese sleeve with peonies and skull. Thanks Harry, till next time! Started with shading on Ervis's japanese leg sleeve today with koi and peonies. Thanks Ervis, till next time!!! Finished Martin's side tattoo with skulls and roses. Thanks Martin, till next time!!! Jason's japanese tiger and octopus leg tattoo. Thanks Jason, till next time!!! First session of shading on Martin's japanese leg tattoo. Thanks Martin, till next time!!! Started Lee's japanese dragon half sleeve today. Thanks Lee, till next time!!! Finished Wagner's japanese koi shoulder tattoo. Thanks Wagner, till next time!!! Started Martin's japanese leg tattoo today. Thanks Martin, till next time!!! 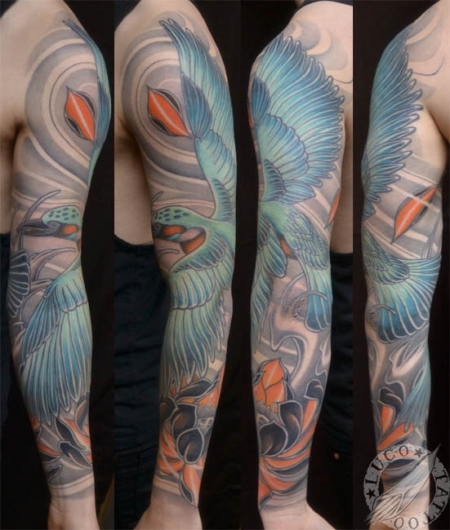 Juan's japanese sleeve. Thanks Juan, till next time!!! Finished Alison's back piece today. Thanks Alison! Started Nick's japanese chest piece today. Thanks Nick, till next time!!! Almost finished with Juan's japanese sleeve. Thanks Juan, till next time!!! Another great session on John's Kali leg from today. Thanks John, till next time!!! Start on Wagner's shoulder kois from today. Thanks Wagner, till next time!!! 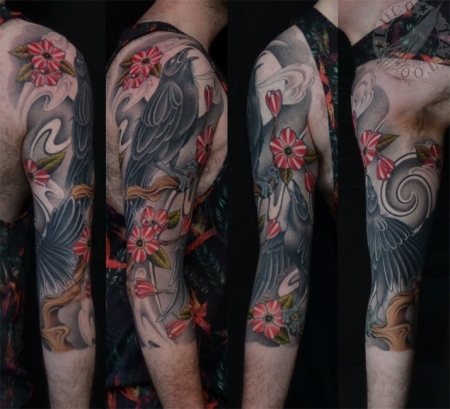 Ryan's japanese raven and blossom sleeve. Thanks Ryan, till ext time!!! Jason's koi tattoo from today. Thanks Jason, till next time!!! Vicky's dragon sleeve. Thanks Vicky, till next time!!! Rob's Japanese half sleeve. Thanks Rob, till next time!!! 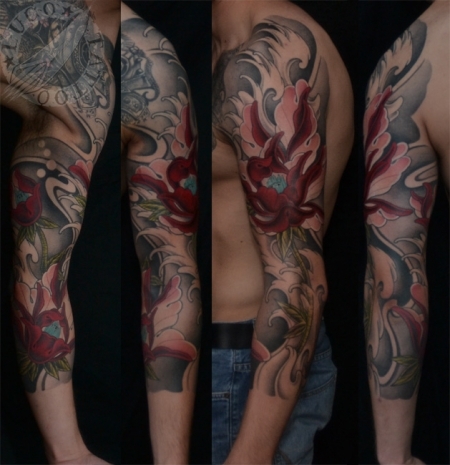 Finished James's peony and wave sleeve today. Thanks James!!! Vicky's dragon sleeve in progress. Thanks Vicky, till next time!!! Session on John's leg from today Thanks John, till next time!!! James's peony sleeve taking shape, one more session to complete. Thanks James, til next time! Started Philip's japanese sleeve today. Thanks Philip, till next time!! Rob's japanese half sleeve in progress. Thanks Rob, till next time! Shading on Neil's dragon from today. Thanks Neil, till next time! Started Ryan's raven and blossom sleeve. Thanks Ryan, till next time! Started John's Sarasvati leg tattoo. Thanks John, till next time! 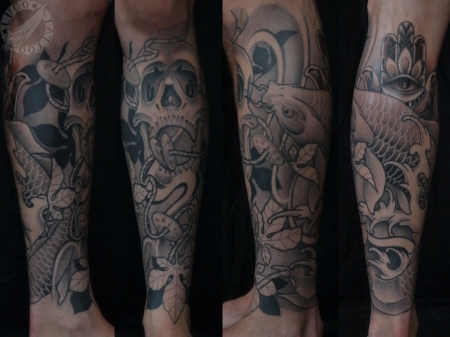 Danny's japanese half leg sleeve. Thanks Danny, Till next time! Great color session on John's leg from today. Thanks John, till next time! Short session on David's back piece from today. Thanks David, till next time!! Miro's back piece in progress. Thanks Miro till next time! John's back of the leg mandala. Thanks John, till next time! 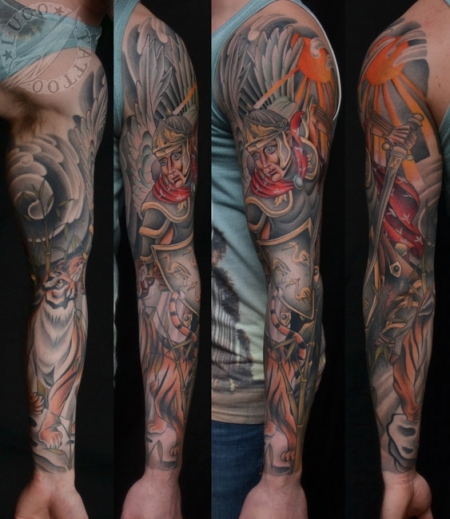 Tom's Hussar and Tiger sleeve. Thanks Tom, till next time! David's front piece! Thanks David, see you soon! Anish's Japanese koi and lotus tattoo. Thanks Anish!!! Another great session on Jason's leg. Thanks Jason! Start on John's leg from today. Thanks John, till next time!!! Mark's Skylark and rose half sleeve. Thanks Mark, till next time!! Progress on Harry's Japanese sleeve from today. Thanks Harry, till next time!!! Shading in progress on Jason's Japanese leg tattoo form today. Thanks Jason, till next time!! Started Rob's Japanese half sleeve today. Thanks Rob, till next time!!! Finished Stephan's Japanese skeleton and peony tattoo. Thanks Stephan, till next time!!! Steve's Jack Sparrow sleeve. Thanks a lot Steve!!! Finished Boris's Japanese full sleeve tattoo today. Thanks a lot Boris!!! 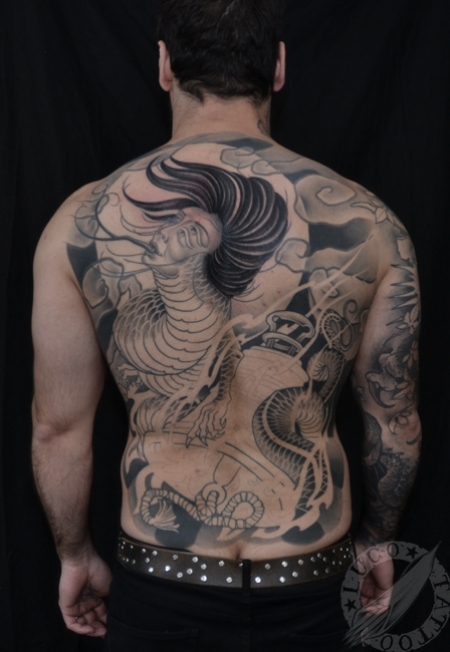 Finished Neil's Japanese back piece tattoo of Dragon and Phoenix. Thanks Neil!!! Had a great session yesterday on Jason's leg. Thanks Jason, till next time! Finished Ty's Japanese dragon sleeve today. Thanks Ty! Had a great session of shading today on Tom's sleeve. Thanks Tom, till next time! Backgroung session on Chris's Japanese sleeve from today. Thanks Chris, till next time! Roy 's Japanese chest piece in progress. Thanks Roy, till next time! Luka's Iron Maiden tattoo. Thanks Luka! Chris's skulls and roses rib piece. Thanks Chris! Started Tom's first tattoo and straight in for sleeve. Thanks Tom, till next time! Finished Helen's Japanese sleeve today. Thanks Helen! One more session to go on Stephan's Japanese tattoo. Thanks Stephan, till next time! Start on Harry's second Japanese sleeve. Thanks Harry till next time! Got to finish Andy's sleeve today.Thanks Andy! Started Steve's Jack Sparrow pirate sleeve today. Thanks Steve till next time! Anthony came all the way from Perth to get his tattoo done. Thanks Anthony, till next time! Start on Jake's king reaper sleeve! Thanks Jake, till next time!! Danny's first tattoo! Japanese leg piece. Thanks Danny, till next time! Harry's first tattoo!! 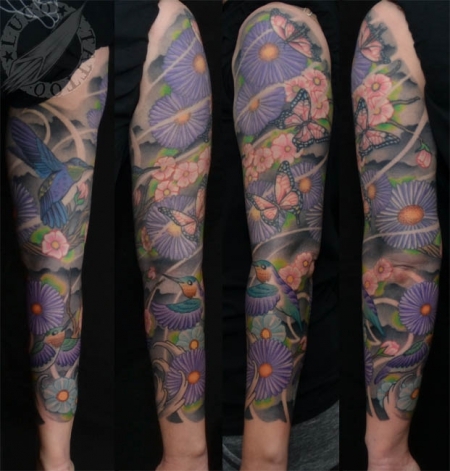 Japanese sleeve of birds and flowers. Thanks Harry, till next time. Stu's dinosaur sleeve in progress. Thanks Stu, till next time! 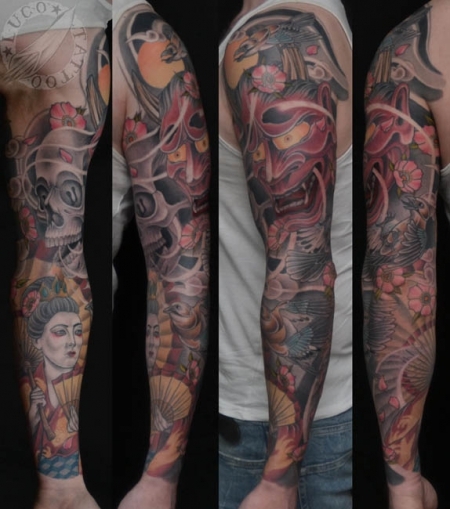 Done with Liam's Japanese sleeve tattoo of Hannya mask Geisha, skull and Jay birds. Thanks Liam, till next time! David's Japanese backpiece tattoo from today. Thanks David, till next time! Oli's all healed black and grey sleeve. Thanks Oli, till next time! Started with background today on Ty's Japanese dragon sleeve. Thanks Ty, till next time! Ashley's ship tattoo with some Japanese waves. Thanks Ash! One more session to go on Liam's Japanese sleeve. Thanks Liam!! Done with Garry's Japanese dragon tattoo. Thanks Garry, till next time! Start on Boris's Japanese sleeve from today. Thanks Boris! Stephen's black and grey sleeve. Thanks Stephen! Taz's Japanese dragon tattoo around his already existing karate signs. Thanks Taz! Scott's dotwork mandala from today. Thanks mate! Start on Ryan's Japanese tattoo of crow, cover up of old jing jang symbol! Started this Japanese dragon tattoo today on David's leg. Thanks David! 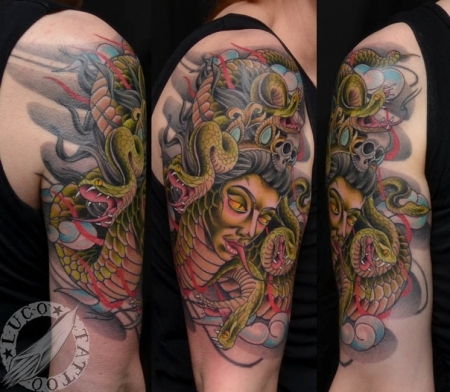 Finished this Japanese snake lady tattoo today on Tracy. Thanks Tray! 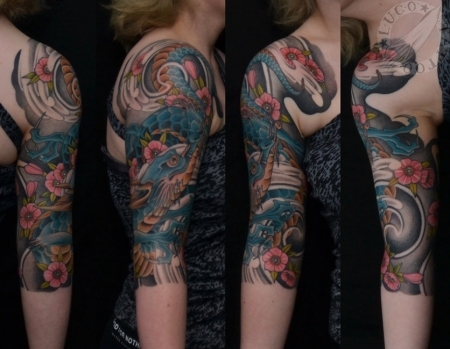 Nick's Japanese dragon full sleeve. Really enjoyed doing this sleeve, thanks Nick! Done with background on MiroTattoo's Japanese back piece thanks for great session bruv! Finished Zak's Japanese sleeve today. Thanks Zak! 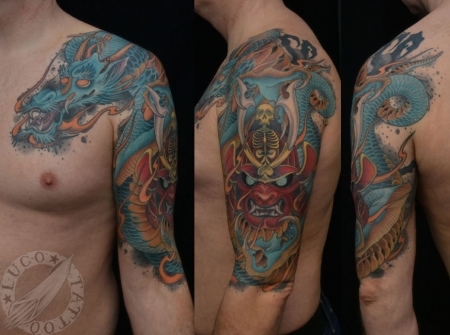 Japanese tattoo of dragon mask samurai skull and koi with flames and maple leaves. 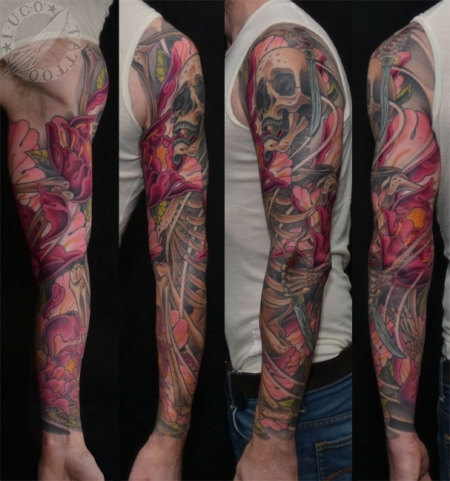 Started with colors on Steve's Japanese sleeve of peonies and skeleton. Thanks Steve! One more session to go on Nick's sleeve of Japanese dragon tattoo. Thanks Nick! Start of David's neo traditional tiger front piece. Finished Nick's squid other day! Just finished this painting, will do prints of it too if anyone fancy. Dan's Buddha and Robins half sleeve from today! Finished Jordan's Kingfisher sleeve today!!! Starting to take enquiries and bookings for February and onwards at O'Happy Dagger in Amersham. I'll be working with O'happy Dagger crew in Amersham from February 2014 !!! finished this half sleeve today.. Thanks Lindsey for letting me do this one on you! did this octopus today on Ksania, her first tattoo and she took it in one go like hero!